February | 2014 | "William's Window"
The only sound was mine.. .
As I clench my fist. As I pass it by. Where is the moon this night? Nothing here seems right.. .
With a mean ol’ frown. Where are the cars on the street? 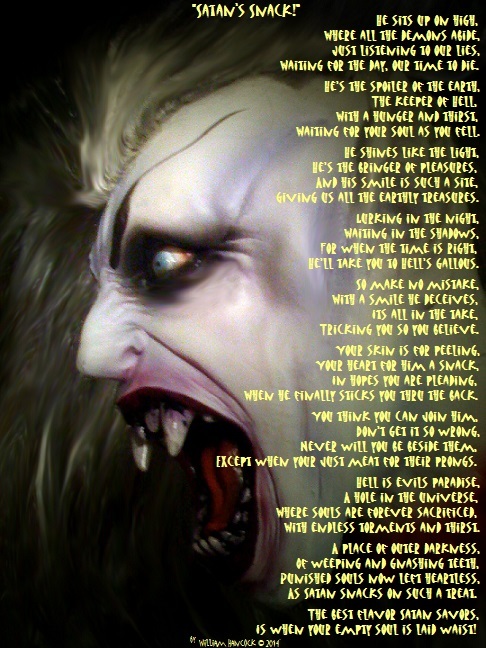 Evil from in Hell’s deep.. . 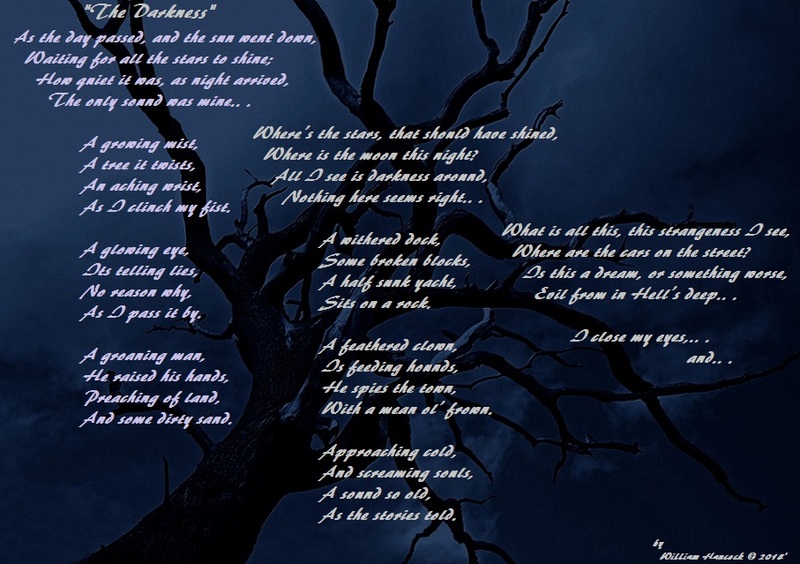 I close my eyes,.. . and.. . Waiting for the day, our time to die. Waiting for your soul as you fell. Giving us all the earthly treasures. He’ll take you to Hell’s gallous. Tricking you so you believe. When he finally sticks you thru the back. Except when you’re just meat for their prongs. With endless torments and thirst. As Satan snacks on such a treat. Is when your empty soul is laid waste! Like its really any and all your biz? There you are, all over me, up and in my life. Something to fill in your days, and all that spare time? Hey! ‘My’ shoes?! 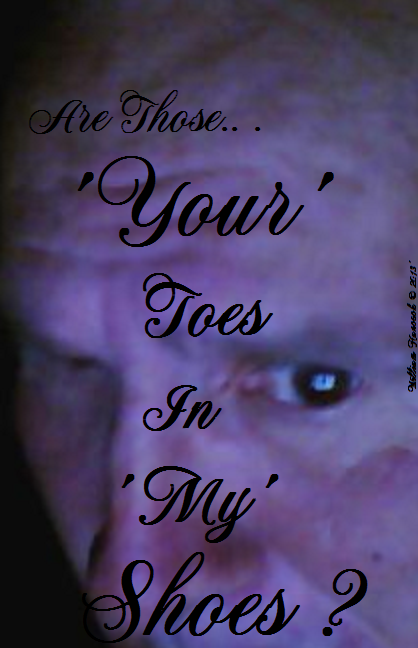 Are those ‘your’ toes, or mine I feel??? Your Memo?? I’m sorry, I must have forgot to send ?! You even know more than all my friends! 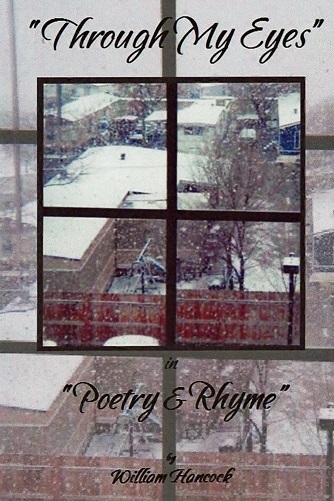 Try getting online, find stuff, stuff to do, like a game,.. .
Write a book, or try a poem, and of course all about me! Some gardening, painting, anything but a trolling fend. There’s your head, everywhere, those nosy eyes, that ear! “You Be Careful Now!”.. .☺. .. Neighbor!! !